Spivey is a four year old neutered male cat that came into the clinic on 6-18-99. When we see a cat like Spivey with obvious jaundice we are usually thinking the worst. 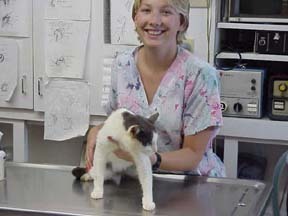 Outdoor cats are frequently exposed to diseases like feline leukemia and feline immunodefeciency virus and present as jaundiced cats. Cats also are commonly afflicted by liver disease that is related to a change in metabolism that causes the liver to become engorged with fat and becomes a progressive disease that is difficult to treat. I lost one of my own cats to this disease about 6 years ago. Diabetes will often result in a jaundiced cat. When Spivey was presented I was almost hoping that he had DIABETES! At least this was something that we could treat and would not require surgery. Angie is smiling in this picture even though we did not find that Spivey had what I was hoping for. That's a good sign. We started with several simple test to rule out renal and kidney disease and made a blood smear to get an impression of how much red cell destruction and white cell response was going on. We came up with a fairly normal chemistry profile on the I-Stat but stumbled into a possible diagnosis on the blood smear. The blood smear revealed the small purple bodies on the surface of the red blood cells in large numbers. These organisms, Hemobartonella felis, cause red cells to be destroyed and in the metabolism of hemoglobin lots of bilirubin (yellow stuff) is produced. Since lots of cats that have Hemobartonella have it because they are immunosuppressed we went ahead and ruled out FeLV and FIV however these tests were negative. 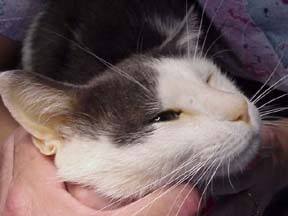 We started Spivey on appropriate antibiotics and he was feeling better within hours. We sent him home on the next morning. Since this disease is contagious and Spivey is an out door cat we recommended isolation for about a week. We will want to keep track of Spivey to make sure things progress as expected but we are EXPECTING steady recovery. We love happy endings and minimal bills and we're hoping Spivey doesn't let us down! Spivey was doing well when we call on 6-22-99 and is scheduled for vaccinations this week.